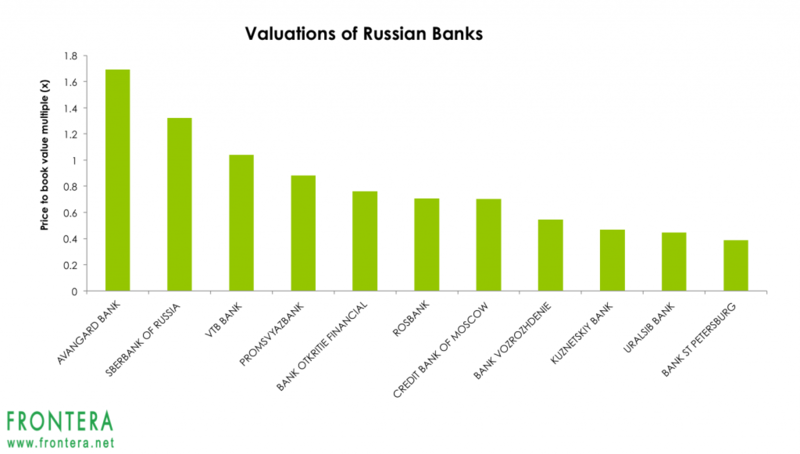 The Russian (ERUS) banking sector is primarily dominated by large national banks. 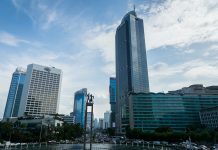 The top three banks in the country held nearly 80% of total assets in 2016, making it highly concentrated. These banks also represent nearly 90% of the total loans provided to customers in Russia last year. This concentration has become gradually larger over the past five years. In 2012, these three banks held 53% of assets and accounted for 64% of total loans in the country. 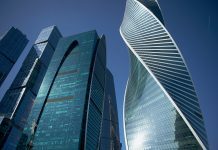 According to IMF classifications, Russian banks are categorized into three groups depending on their ratings, risk exposure and access to interbank markets. The first group is comprised of large top tier banks that have high credit ratings, low funding costs and access to secured and unsecured interbank markets. The second group is made up of mid-sized banks that do not have access to unsecured interbank markets and rely on Central Bank of Russia (CBR) facilities for their funding requirements. Their funding costs generally tend to be higher than large banks. The third group is primarily made up of small banks with low credit ratings, and little or no access to interbank markets. In the past few years, Russia’s banking system has been under stress due to debt problems at the country’s largest oil company Rosneft. Falling oil prices coupled with a weakening currency have created trouble for the country’s banking sector. Recently, the Russian Central Bank rescued Russia’s largest private bank by assets, FK Otkrytie, the largest bail out witnessed in the country’s history. Prior to this, the largest bank bailed out in Russia was the Bank of Moscow in 2011, for $6.7 billion (395 billion rouble). Over the last few years, the CBR has been trying to clean up the Russian banking sector by revoking licenses of under-capitalized banks. 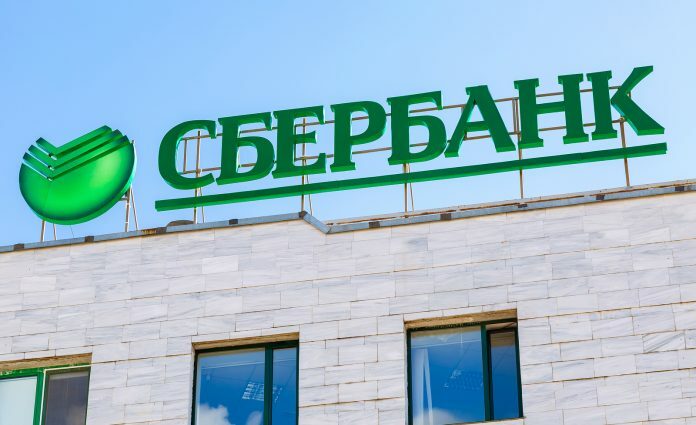 In July this year, CBR cancelled the license of Yugra Bank, the 15th largest bank in Russia. 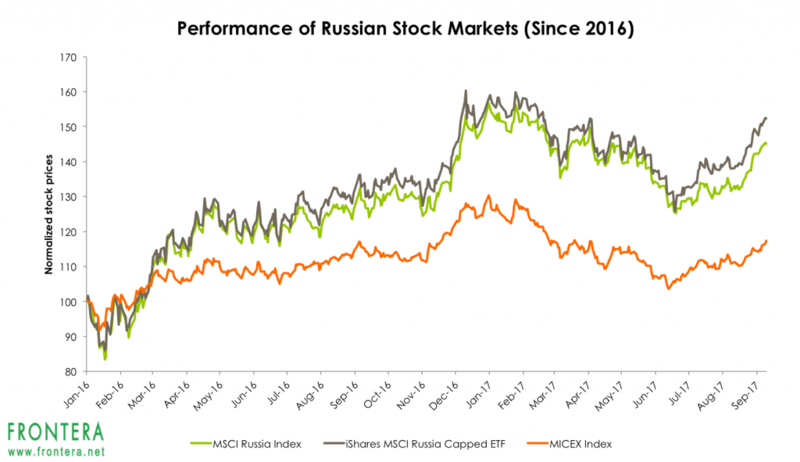 Year to date, the MSCI Russia Index has declined 5% while the iShares MSCI Russia ETF (ERUS) has lost 1%. Comparatively, the Russian benchmark MICEX Index has declined 8% in the year so far. 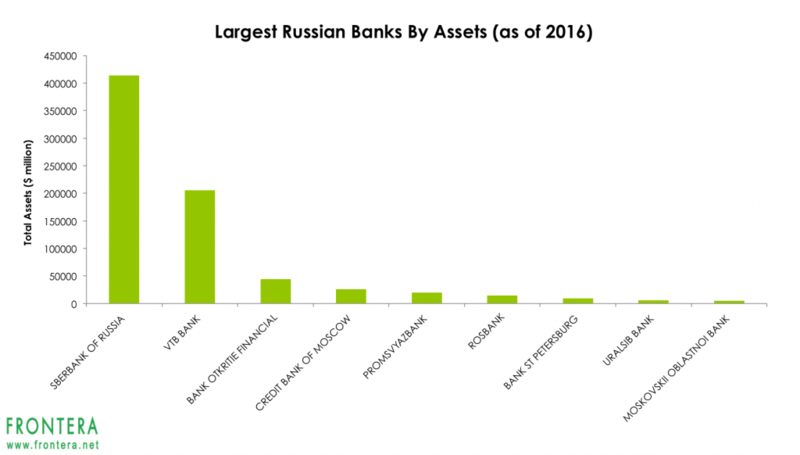 The largest Russian banks by revenues are SberBank of Russia, VTB Bank, Credit Bank of Moscow and Promsvyazbank. In 2016, these companies have generated revenues of $47.4 billion, $21.6 billion, $2.3 billion, and $2.2 billion respectively. 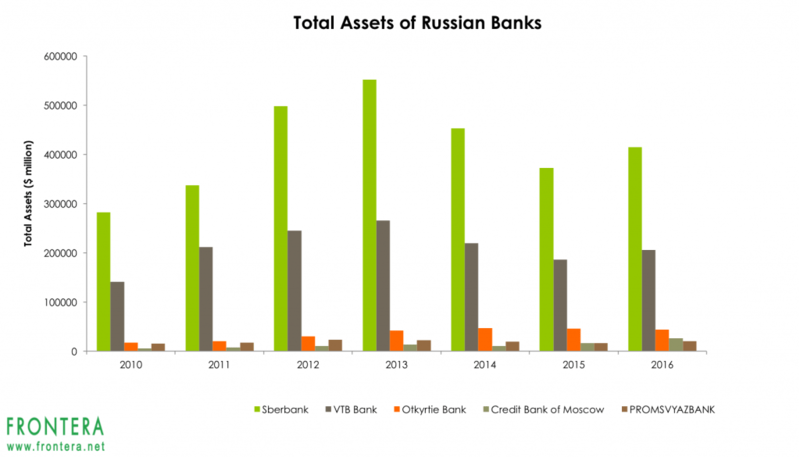 The largest Russian banks by assets are Sberbank of Russia, VTB Bank and Otkyrtie Bank. In 2016, these banks held assets worth $4.1 trillion, $2.1 trillion, and $44 billion respectively. Sberbank (SBER.ME) is the largest bank in Russia with assets of $4.1 trillion in 2016 and a market cap of $70 billion. The Central Bank of Russia is the largest shareholder in the bank with a 50% stake in its authorized capital. Sberbank accounts for roughly 1/3rd of Russia’s banking system and employs nearly 250,000 employees in 16,500 offices. The bank has nearly 137 million retail clients and 1.1 million corporate clients across the world. In 2016, the bank generated revenues of $47 billion and net interest margins of 5.9%. 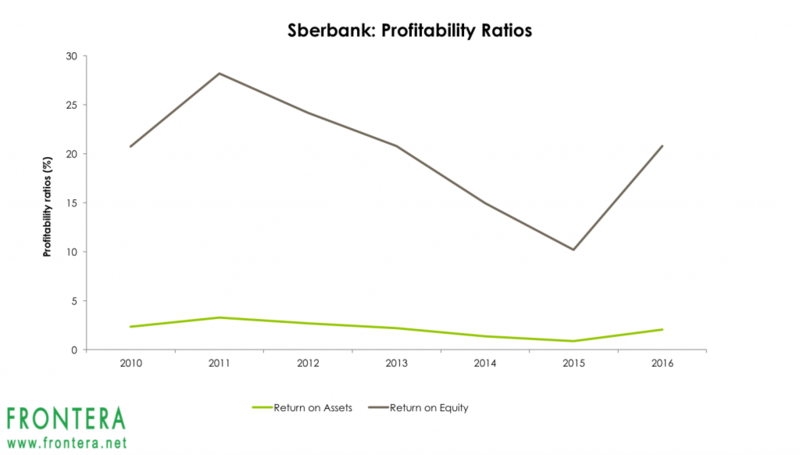 Furthermore, the Sberbank is also the most profitable Russian bank. Last year, the bank reported return on assets of 2.1% and return on equity of 20.8%, highest among its peers. The company’s shares have been listed on the Russian stock exchange since 1996 and have returned 9.3% in 2017 to date. Shares of the bank are also listed on the Frankfurt Stock Exchange with the ticker SBNC.F. The bank’s ADRs are listed on OTC Markets with ticker SBRCY and on the London Stock Exchange with ticker SBER.IL. 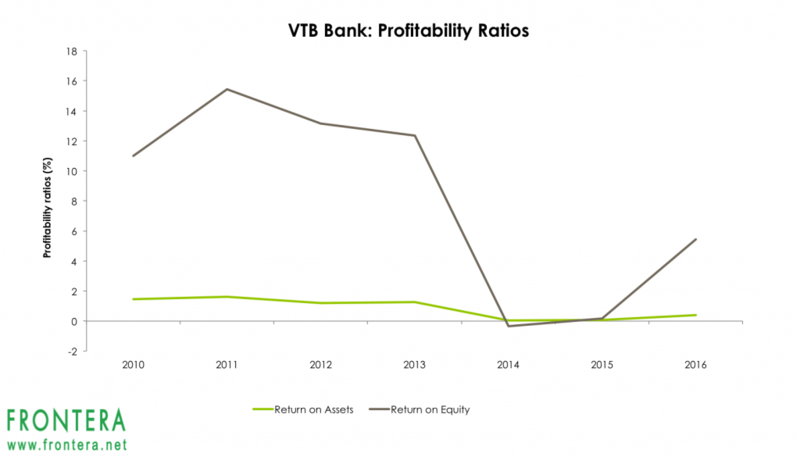 VTB Bank (VTBR.ME) is the second largest bank in Russia in terms of assets. The bank held assets worth $2.1 trillion in 2016 and has a market cap of $13.9 billion. The Russian government holds a 60% stake in the bank. 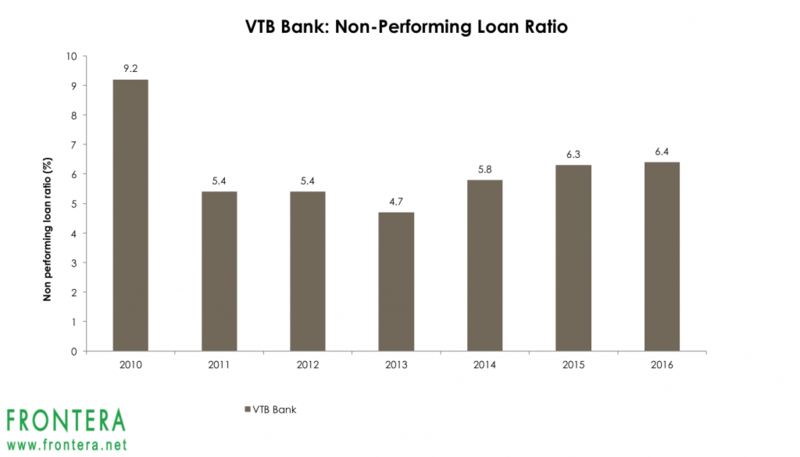 VTB Bank has set a target of increasing retail deposits to 39% of liabilities by 2016, from 27% in 2016. The bank is shifting away from expensive central bank and interbank sources of funding to cheaper retail deposits. Moody’s believes this trend will result in higher net interest margins for the bank and forecasts NIMs of 3.7% in 2017. Moody’s also expects the bank’s non-performing loan ratio to decline as the Russian economy recovers. The company’s shares are listed on the Russian exchange and have lost 14% of their value in 2017 to date. Shares of the bank are also listed on the Frankfurt and Stuttgart Stock Exchanges with the tickers KYM1.F and KYM1.SG respectively. The bank’s ADRs are also listed on OTC Markets with ticker VTBR.IL. 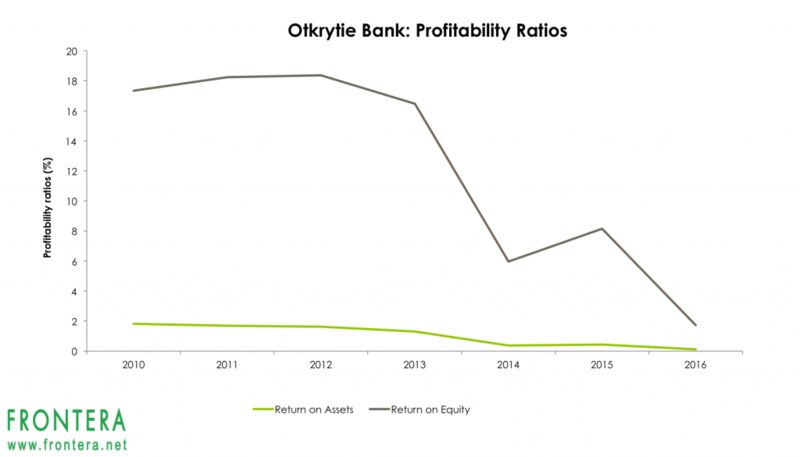 Otkrytie (OFCB.ME) is the third largest bank in terms of assets and the largest private bank in Russia. The bank held assets worth $44 billion in 2016 and had a market cap of $4.3 billion. Recently, the Central Bank of Russia took a 75% stake in Otkrytie as the bank had to be bailed out after its deposits fell sharply. In June it lost $1.7 billion in deposits. Otkrytie’s external funding declined nearly 30% while its deposits contracted by nearly $10.6 billion (611 billion roubles) in June and July, equivalent to 20% of the bank’s balance sheet. 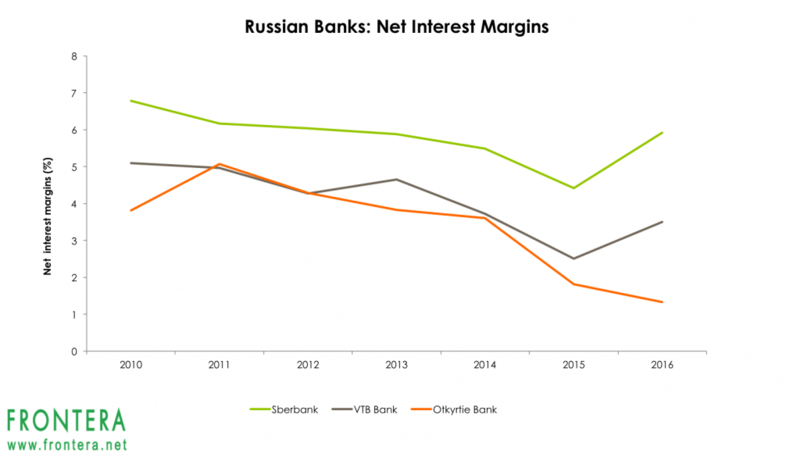 Otkrytie turned towards the Central Bank of Russia to fund its gap of $5.7 billion (333 billion roubles) and shrank its corporate loan book by 38%. In July this year, Russian rating agency ACRA raised a red flag on the “low quality” of Otkrytie’s loan portfolio and assigned a BBB- rating. 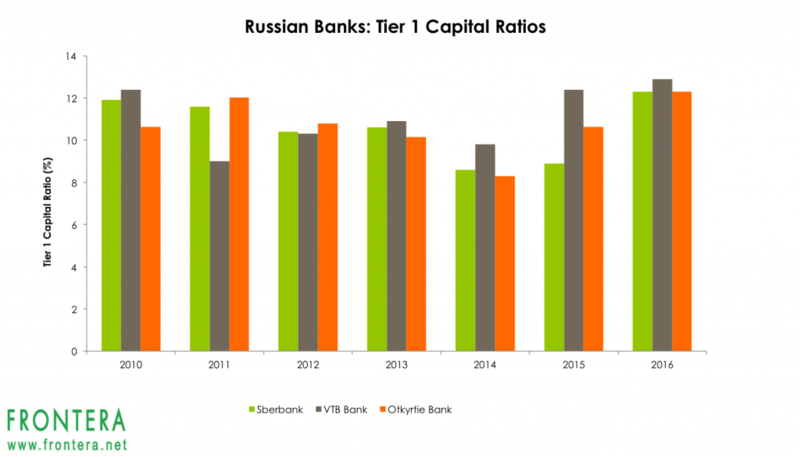 However, Otkrytie’s filings for 2016 indicate the bank’s capital position was healthy, and met the Central Bank’s requirements. In 2016, the bank reported a non-performing loan ratio of 7.5% and tier 1 capital of 12.3%. CBR’s deputy chairman, Dmitry Tulin, has raised doubts about the accuracy of these numbers. “The capital disclosed in (the previous) reports seems to have been significantly higher than in reality,” stated Tulin. The company’s shares are listed on the Russian exchange and have lost 22% in value in 2017 to date. Otkrytie is 65% owned by Otkrytie Holding, which is in turn owned by executives from oil major Lukoil, VTB bank, and Otkrytie, amongst others. 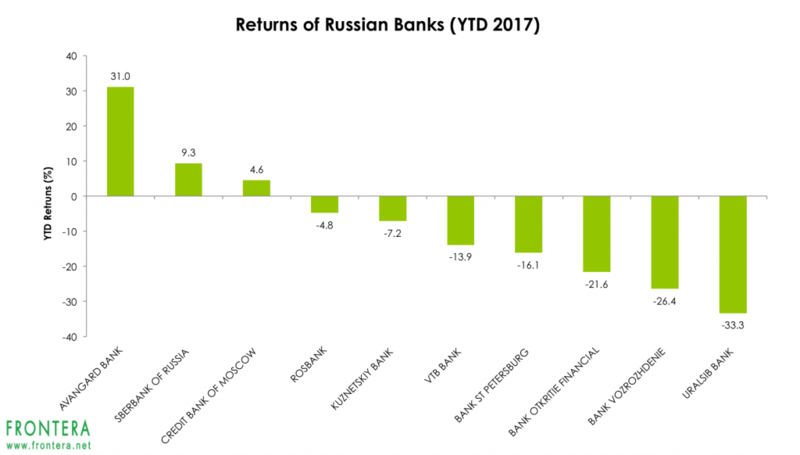 Valuations within the Russian banking sector are attractive with Russian banks trading at an average price to book ratio of 0.8x. 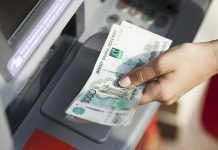 Bank of St.Petersburg, Uralsib Bank (USBN.ME) and Kuznetskiy Bank (KUZB.ME) are the most attractively priced banking stocks based on their cheap valuations. These stocks have price to book ratios of 0.38x, 0.45x and 0.47x and are trading at the steepest discount to their peers. Meanwhile, Avangard Bank (AVAN.ME), Sberbank and VTB Bank are currently expensive. Previous articleBefore And After China’s ICO Ban: Which Countries Are Trading The Most Bitcoin Cash? Next articleChina’s Two Stock Exchanges Are Amongst the Largest In The World, But Exactly How Do They Size Up?